When I first saw Claws of Furry, I thought to myself, that looks charming at least. I mean, a game about cats beating up rats and other enemies of their species. It sounded like a delightful multiplayer beat em up with some cute aesthetics. However, what I found was an incredibly unbalanced and wonky beat ’em up where even the adorable premise couldn’t redeem the final product. To start Claws of Furry, you go through a very brief tutorial section where you learn the controls. A giant mecha dog captures the dojo master and after a quick back and forth he is off with your trainer. Then there are three different modes, arcade, rogue, and pussycat. Arcade is the typical horde style mode where you try to defeat as many enemies as possible. Rogue is the primary mode that takes you back to the start if you die, and Pussycat is the main mode again, but your saves will keep you at the level you were on if you die. As I started, I thought to myself, “I am pretty good at video games so I will try out the first mode.” After a couple of levels, I was met with repetitive combat and some frustrating level design that ultimately led me to back out of this mode and going to the one that kept my save point. The only way I would imagine anyone getting very far in this game mode would be if they had three other friends to play with because trust me, you do not want to have to play some of those levels ever again. The first couple levels throws some rats and mega rats (that is what I am going to go with) at you. Not to difficult. Once you defeat all the enemies in the stage, you will proceed to the next level. About three levels in, the first boss battle occurs. This was one of the most repetitive boss battles I have ever encountered. This boss is a small mouse, controlling a gigantic and muscular rat. You must jump on top of the big rat and hit the mouse before the second stage of the fight occurs. 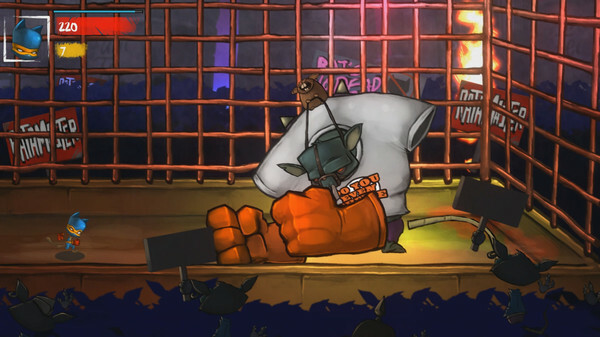 After defeating the mouse, the colossal rat will bust off his shirt and then either call some minions to help defeat you, try to punch you or charge you. Besides the not so great platforming and the lackluster amount of combat capabilities, this was where my first major concern with Claws of Furry happened. The only way to defeat this boss was to charge up the super and use it against him. Normal punches would only take an abysmal amount of health away so it would take literally probably hours to go that route. So, this left me jumping from each side of the room punching the rat minions that were called to build up my super so I could do a little bit of damage on the boss. Repeat this for about ten whole minutes and finally, the boss will be defeated. The repetitive nature of this boss battle set a precedent for the rest of Claws of Furry. On top of this frustrating boss design, some of the level design and enemy placement was equally as frustrating. In the second area of Claws of Furry, there are crocodiles that will jump vertically of the water below to try to hit you. However, there are also other enemies on the platforms that jump horizontally to try to cause some damage. So, after trying to jump over those enemies, the camera wouldn’t show what was beneath you and ultimately would end up with getting hit by something jumping out of the water that you couldn’t even see in the first place. Now, this could actually lead to some fun gameplay if you were playing with a group. The random Mahem of New Super Mario Bros led to some awesome moments so I can see Claws of Furry having the same effect. There didn’t seem to be any depth to Claws of Furry at all. Each level was just filled with a bunch of enemies that must be defended or maybe a boss battle and that is really it. Jumping around and clawing enemies to death got old pretty quickly and when that is the main mechanic of the game, that is not a very good sign. The controls might be one of the only redeeming factors in the game. The movement feels tight and jumping from platform to platform was done at ease. Your character never feels too floaty and I was never but into one of those situations where I knew how to control something but Claws of Furry wouldn’t let me. The fluidity of your movement was actually quite surprising compared to the rest of the game. While the charm of a side-scrolling beat ’em up where cats beat up their mortal enemies sounds very cute and appealing, that initial feeling is quickly taken away. After each level, I was left never left with satisfaction. I just felt glad it was over with. Claws of Fury might be a little more entertaining to play with a group of friends, but if you don’t have any friends to play with, you might take a pass on this one.